Alumni in Class of 1920 H.S. Class of 1920. N. Eugene Allen. He received a BYH Business Diploma in 1920. Source: Annual Record, B.Y. University, Book 9, page 261. Class of 1919 and 1920. Class of 1919. Hugh Anderson. Graduated from Brigham Young High School in 1919. Source: 1919 BYU Banyan yearbook, BYH section, pages 61-74. ~ ~ ~ ~ Class of 1920. Hugh Anderson. Graduated from Brigham Young High School in 1920. Source: 1920 BYU Banyan yearbook, BYH section, page 65-85. Classes of 1920 and 1921. Melba Bachman. She received two diplomas in 1920: a BYH Business Diploma and a High School Diploma. Source: Annual Record, B.Y. University, Book 10, page 136. ~ ~ ~ ~ Class of 1921. Melba Bachman (not Backman). Source 1: Graduation photo of the Class of 1921. ~ ~ ~ ~ Source 2: 1921 BYU Banyan yearbook, BYH section. ~ ~ ~ ~ Melba Lillian Bachman was born on July 22, 1902 in Provo, Utah. Her parents were Benjamin Bachman and Isabelle (Belle) Yardley Milner Bachman. Melba married Lawrence Woodford Andrews on November 2, 1937 in New York City, New York. Melba Bachman Andrews died on June 23, 1986. Class of 1920. Laverne Banks. Graduated from Brigham Young High School in 1920. Source: 1920 BYU Banyan yearbook, BYH section, page 65-85. Classes of 1920 and 1922. Class of 1920. Pearl Beck. She graduated from Brigham Young High School in 1920. Source: 1920 BYU Banyan yearbook, BYH section, page 65-85. ~ ~ ~ ~ Class of 1922. Pearl Beck. She received a BYH Normal Certificate in 1922. Source: Annual Record, B.Y. University, Book 10, page 248. Class of 1920. LaMar Bird. He graduated from Brigham Young High School in 1920. Source 1: 1920 BYU Banyan yearbook, BYH section, page 65-85. ~ ~ ~ ~ Class of 1920. Lamar Bird. He received a High School Diploma in 1920. Source: Annual Record, B.Y. University, Book 10, page 138. Class of 1920. Mildred Boyer. She received a BYH Normal Certificate in 1920. Source: Annual Record, B.Y. University, Book 10, page 312. Class of 1920. Delia Broderick. She received a BYH Business Diploma in 1920. Source: Annual Record, B.Y. University, Book 10, page 138. Class of 1920. Velma Bylund [not Velina]. She received a BYH Normal Certificate in 1920. Source: Annual Record, B.Y. University, Book 10, page 8. ~ ~ ~ ~ Velma Lavinna Bylund was born on July 12, 1900 in Santaquin, Utah. Her parents were Eric Olaf Bylund and Elizabeth Louvinna Boyle. Velma married Wilford Hornberger Brox on June 9 [or 8], 1926 in Salt Lake City, Utah. Velma Bylund Brox died on May 22, 1995 in Long Beach, California. Class of 1920. Helen Candland. Graduated from Brigham Young High School in 1920. Source: 1920 BYU Banyan yearbook, BYH section, page 65-85. ~ ~ ~ ~ Class of 1920. Helen Candland. She received a High School Diploma in 1920. Source: Annual Record, Book 10, page 10. ~ ~ ~ ~ Collegiate Grad of BYU, Class of 1924. Helen Candland. She received an AB Degree in English in 1924. Source: Annual Record, B.Y. University, Book 10, page 10. ~ ~ ~ ~ HER OBITUARY: Helen Candland Stark, after a life which embraced many interests, died on Wednesday, May 25, 1994 in Provo, Utah. Born September 18, 1901 in Mt. Pleasant, Utah, to Arthur Charles and Lydia Hasler Candland, she was the eldest of nine children -- five brothers and four sisters. Five brothers and one sister preceded her in death. She was educated at Brigham Young High School, then attended Brigham Young University where she was graduated in Theatre and Drama in the new Department of Dramatic Arts. Her major professor was T. Earl Pardoe. She received her Masters Degree in English in 1936. She taught high school in Kanab, Jordan and for nine years at Bingham High School where she instructed in English and Dramatic Arts. She married Henry M. Stark, of Spanish Fork, Utah, in Washington D.C. on his birthday, March 28, 1936. He was a PhD chemist working for DuPont. They were pioneers in establishing a branch of the LDS Church in Delaware. Their old stone house and five pristine acres became a center for the growing LDS population. After Henry retired, the Starks decided to move ``home'' to Utah. In Delaware eager developers wanted to break up their five acres, and in Salem the attitude of the mayor made the Starks avid conservationists. Henry passed away on January 24, 1988 in Provo, Utah. During her lifetime she was interested in many causes, including with her husband: setting up a scholarship for ``Women In Science''; endowing a lectureship in honor of Alice Louise Reynold; and spearheading a drive to build an Alice Louise Reynold Room in the new Harold B. Lee Library. With her husband, Henry, she gave an endowment to the Lytle Ranch near St. George. They were interested in the Bean Museum project because it was a further attempt to save the wilderness. One of her major interests was a concern about the problems of women. Housebound for years by peripheral neuropathy, she used her mind to write many articles and essays, of which some have been published. She is survived by her three children, David in Salt Lake City; Sara in Arizona; and Karen in Texas. She is also survived by 13 grandchildren. Funeral services were held Saturday, May 28, 1994 in Orem. Burial was in the Spanish Fork City Cemetery. The family wishes contributions be made in memory of Helen Stark to the Brigham Young University Library Memorial Program, Harold B. Lee Library, Provo, Utah 84602-6800. [Deseret News, Thursday, May 26, 1994.] ~ ~ ~ ~ Her parents: Arthur Charles Candland and Lydia Hasler, married October 13, 1897, in Manti, Utah. They had nine children, including the following seven: Helen Candland, born September 18, 1901 in Mt. Pleasant, Utah [BYH Class of 1920]; Harold Arthur Candland, born March 16, 1903 in Mt. Pleasant, Utah [BYH Class of 1923]; Don Charles Candland, born February 4, 1909 in Mt. Pleasant, Utah [BYH Class of 1928]; Louise Candland, born December 12, 1910 in Provo, Utah [BYH Class of 1929]; Arthur Ben Candland, born January 7, 1915 in Provo, Utah [BYH Class of 1933]; Ruth Hanna Candland born October 13, 1917 [or 1916] [BYH Class of 1935]; and Barbara Hope Candland, born October 4 [or 14], 1918 [BYH Class of 1937]. Class of 1920. Loris B. Cardall (male). Graduated from Brigham Young High School in 1920. Source: 1920 BYU Banyan yearbook, BYH section, page 65-85. Class of 1920. Claude Cardell. 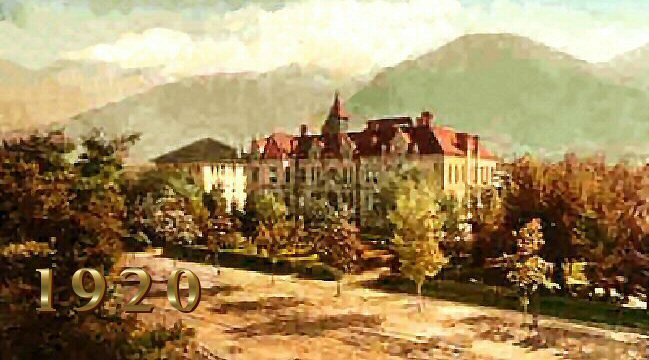 Graduated from Brigham Young High School in 1920. Source: 1920 BYU Banyan yearbook, BYH section, page 65-85. Class of 1920. Alden Chatwin. He received a High School Diploma in 1920. Source: Annual Record, B.Y. University, Book 10, page 142. Class of 1920. Leah Chipman. She graduated from Brigham Young High School in 1920. Source 1: 1920 BYU Banyan yearbook, BYH section, page 65-85. ~ ~ ~ ~ Class of 1920. Leah Chipman. She received a High School Diploma in 1920. Source 2: Annual Record, B.Y. University, Book 10, page 208. ~ ~ ~ ~ Collegiate Grad of BYU, Class of 1924. Leah Chipman. She received a BS Degree in Dramatic Arts in 1924. Source: Annual Record, B.Y. University, Book 10, page 208. Classes of 1919 and 1920. Virginia Christensen. She graduated from Brigham Young High School in 1919. Source: 1919 BYU Banyan yearbook, BYH section, pages 61-74. ~ ~ ~ ~ Class of 1920. Virginia Christensen. She graduated from Brigham Young High School in 1920. Source 1: 1920 BYU Banyan yearbook, BYH section, page 65-85. ~ ~ ~ ~ Class of 1920. Virginia Christensen [Keeler]. She received a High School Diploma in 1920. Source: Annual Record, B.Y. University, Book 10, page 208. ~ ~ ~ ~ Virginia Christensen was born on September 6, 1901 in Manti, Utah. Her parents were Albert Christen H. Christensen and Ellen Virginia (Jennie) Snow Christensen. She married Daniel Mandeville Keeler on January 3, 1923 in Salt Lake City, Utah. Virginia Christensen Keeler died on May 14, 1970 in Provo, Utah. Her interment, Provo, Utah. Class of 1920. Min Clayson. She received a BYH Normal Certificate in 1920. Source: Annual Record, B.Y. University, Book 10, page 314. Class of 1920. Ora Cloward. She received a BYH Normal Certificate in 1920. Source: Annual Record, B.Y. University, Book 10, page 314. Class of 1920. Bernice Cluff. She graduated from Brigham Young High School in 1920. Source 1: 1920 BYU Banyan yearbook, BYH section, page 65-85. ~ ~ ~ ~ Class of 1920. Bernice Cluff. She received a High School Diploma in 1920. Source 2: Annual Record, B.Y. University, Book 10, page 146.